All transactions are safe and secure with a reliable history in online purchasing behind each of our associates. 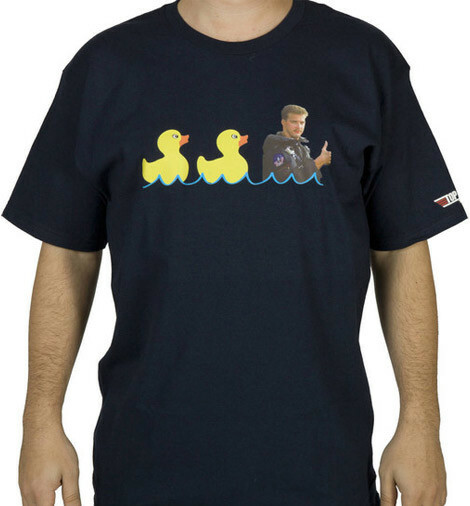 Buy the Top Gun Duck Duck Goose t-shirt to own Top Gun clothing and merchandise. These Duck Duck Goose Top Gun t-shirts feature the US Navy Fighter Weapons School logo on the sleeve, in addition to the humorous depiction of two ducks and Goose on the front. The "Topgun" fighter pilot school is a real school located at NAS Miramar in San Diego, California. Wear this funny tee and pretend that you are the United States Navy Fighter Weapons School Top Gun pilot Goose. Pair this and a hat as part of an aviator Top Gun costume. In addition to the Top Gun Duck Duck Goose tee above, browse the Top Gun Clothing Gallery for more apparel like men's and women's clothes, kids shirts or hoodies.